I have another heart warming recipe for you guys to help you through those cold winter days. 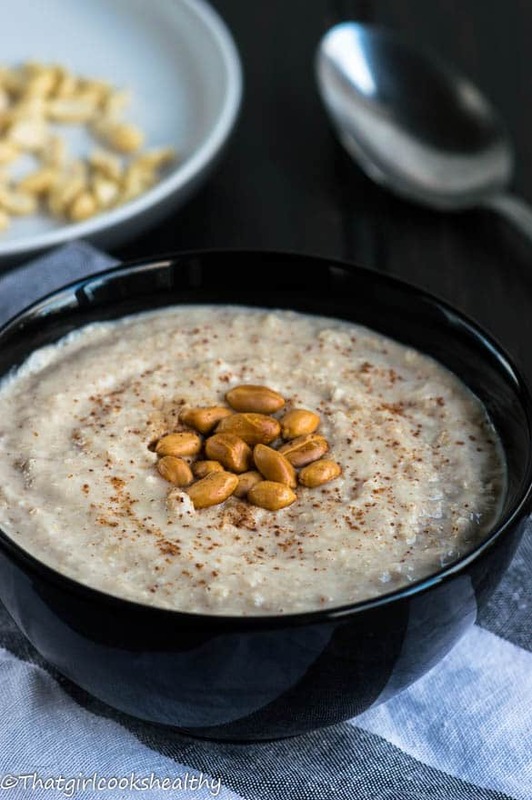 If you love porridge recipes then you will certainly enjoy some Jamaican peanut porridge – it’s rich, thick and incredibly creamy and packed with flavour too. What is Jamaican peanut porridge? A breakfast porridge which is made from peanuts, spices, water, coconut milk and sweetened with condensed coconut milk. Some people like to add oatmeal for thickness and more texture. Jamaican peanut porridge is the big sister to the peanut punch that I made several weeks ago. Let’s talk about the sweeteners!! I cannot empathise how ecstatic I am since discovering this ground breaking dairy free condensed milk. Condensed milk is one of, if not the key sweeteners for many Caribbean dishes that call for condensed milk. Since condensed milk is traditionally made with cows milk that was off limits for me. This super sweet liquid nectar supersedes the flavour of a low GI index sweetener like coconut palm sugar, believe me when I tell you how many times I’ve tried to tweak a Caribbean cuisine with palm sugar and winded up with an epic fail. After many months of trial and error I’ve managed to make another foolproof Caribbean breakfast delight – vegan and gluten free. Jamaicans love their porridge in the morning, it’s overloaded with protein and healthy heart fats. As protein tends to breakdown in the digestive system relatively slow, this creates a fuller feeling for much longer. 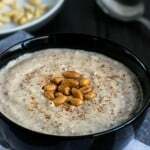 The protein and energy levels from the porridge are suitable for someone requiring a large quantity of protein at a given time or a muscle training. 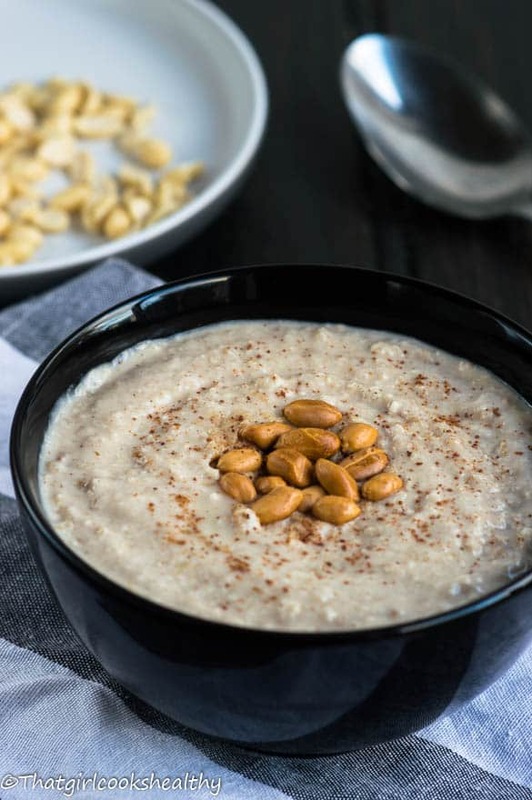 This peanut porridge will melt your heart, literally it’s so flavourful thanks to the equal parts of nutmeg and cinnamon. I promise you won’t be disappointed, but you’ll have to try it to believe me. pinch of Himalayan pink salt. Blend the peanuts in water on high speed until completely ground. Pour the liquid into a saucepan and allow to boil then reduce to low heat and simmer for 5 minutes, stirring throughout to avoid sticking. Once the peanut mixture starts to thicken stir in the vanilla, cinnamon, nutmeg and salt. 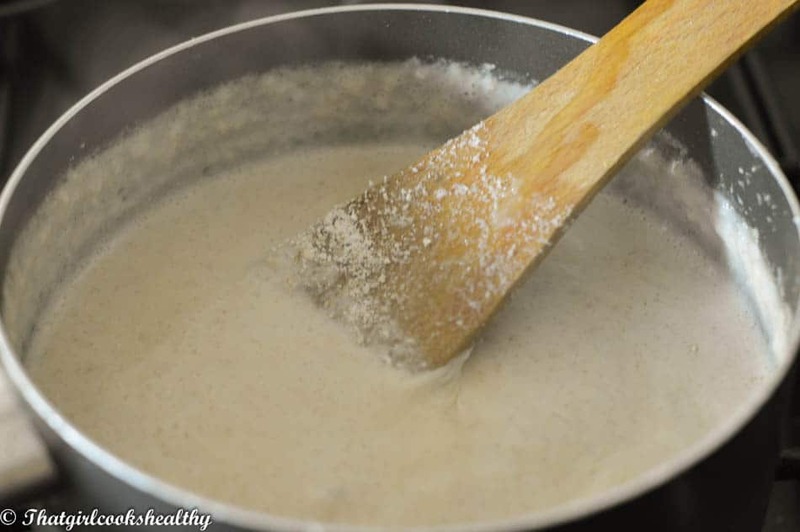 Continue to stir while finally adding the condensed coconut milk, oats/tapioca flour and the coconut milk. When everything has been incorporated, allow to simmer for a further 10-15 minutes. The porridge will thicken completely as it starts to cool down. Can substitute tapioca flour instead of using ground gluten free oats for a grain free option. Charla, this looks amazing- Peanuts , coconut milk , nutmeg. Where have you been all my life? I am so making this!!! I have yet to try your homemade condensed coconut milk . Hopefully will do that pretty soon. Thanks for sharing. Yes, please do……and I hope you like it. Peanut porridge is my all time favourite! I have been trying to emulate the PP that I received from a Rasta vendor in Ochi a couple of years back….this might be it! Although I used red skin peanuts which gave the porridge a lovely red hue, I didn’t have time to make the condensed coconut milk so used Demerara suger. It’s delicious! Thanks for sharing your recipe! Awesome Sam! So glad you enjoyed the recipe. I actually rotate between the red skin and blanched peanuts both are equally as tasty and yes the red hue certainly enhances the appearance. Sounds perfectly clean! May I susbsitite coconut milk with almond milk? Hi Massiel. Thanks for commenting. Yes, you certainly can use almond milk instead, I haven’t tried this myself but I would love to know how it tastes. *Meant to leave all five stars! Yay! You sound fully prepared. I’m looking forward to your feedback and a picture by email would be nice too.